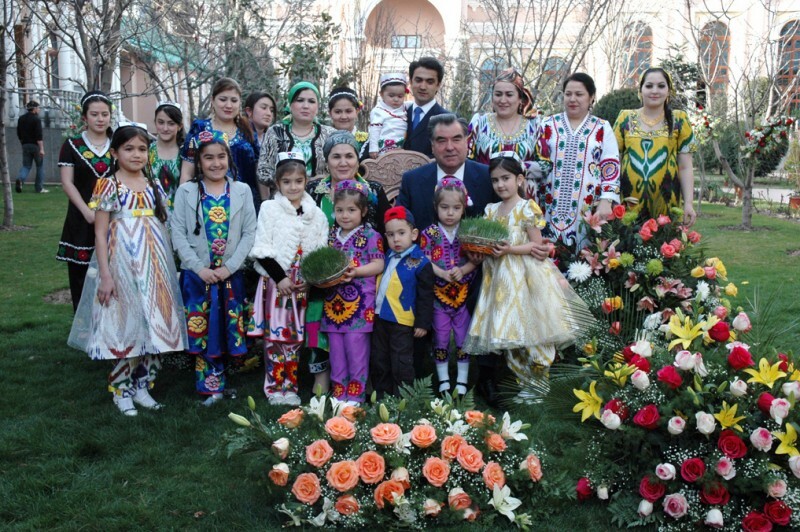 The Rahmon family. Somon is not pictured here. Wikipedia image. Earlier this year Global Voices reported on the official that compared autocratic Tajik President Emomali Rahmon to ‘the sun’. Now, a random schoolboy who secured $50,000 from a man by posing as Rahmon's ‘son’ is being investigated by the anti-corruption agency controlled by one of Rahmon's real sons, Rustam Emomali. In Tajikistan — where connections mean everything and a genetic link to Rahmon is the biggest trump card of them all — people tend to have faith in government corruption, if nothing else. So when Khushdil Kurbonov, a 10th grade high-school student of prestigious Dushanbe International School, was able to ingeniously present himself to a local citizen as Rahmon's youngest son, Somoni Emomali, and promised to secure the said citizen a piece of land outside the capital — it did not take the man long to front up the cash. A senior school student pretending to be the son of Tajik President Emomali Rahmon was detained in Dushanbe after he received $50,000 bribe in exchange for land, media reports say May 6. Tenth-grader Khushdil Kurbonov introducing himself as Somoni Emomali, the president's [youngest] son, took $50,000 from a man in exchange for promising him 0.3 hectares of land outside the capital. Kurbonov then called a local official and instructed him to hand over the land, but the official did not believe him. The media reports say Kurbonov attends the same school as Somon [pictured here on the right], who is also a 10th-grader. The Agency for State Financial Control and Combating Corruption is investigating into the case. The event also led the Anti-Corruption Agency, which has been led by elder son and potential successor Rustam since March, to call the population to fight against criminal offences connected to the relatives of state officials. This call was viewed as a deep irony in a country which many think the President's family treats like a personal piggy bank. Tajik Facebook users discussing the schoolboy's fraud mourned the fact that corruption has cemented itself in the country's schools. Abumuslim Kalandarov, a member of Facebook group Ya Dushanbinets- 2, wrote that the schoolboy was a “good strategist” in a country where government makes it difficult to make a living honestly. He is not a jerk; rather, he is a good strategist. He knew the disadvantages of our society and worked well within that space. Other Facebookers condemned his victim's naivety. Бездарные чиновники и люди, поверившие на слово малышу! Завтра так родину продадут какому-нибудь чужеземцу по звонку! Я в трансе! Incompetent officials and the people who believed in this kid! Maybe tomorrow they will sell the motherland to some stranger over the phone! I am in a trance! Highly-placed officials in Tajikistan, many of whom are linked to Rahmon by blood or regional ties, seem to be able to guarantee impunity for their badly behaved relatives, even in extreme circumstances. For example, in October 2013, Rasuli Amonullo, the 16-year-old son of the then-head of the Tajik Railways Company, was behind the wheel in a car accident that killed three people. Amonullo, who was too young to drive anyway, escaped investigation while his parents were charged approximately $20 for irresponsibility. Интересно другое, до какой степени у нас в крови чинопочитание что ребенок может приказывать государственному чиновнику…. It is interesting the extent to which servility has gotten into our blood that a kid [has the nerve] to order a state official…. I bet that he is the scion of some other official, because we could never afford to educate our children at this school.